The heart is the traditional symbol of love, unending and constant. What better way to express your feelings than with the perfect combination of the untarnishability of gold, the eternal symbol of the heart and the strength and beauty of diamond. 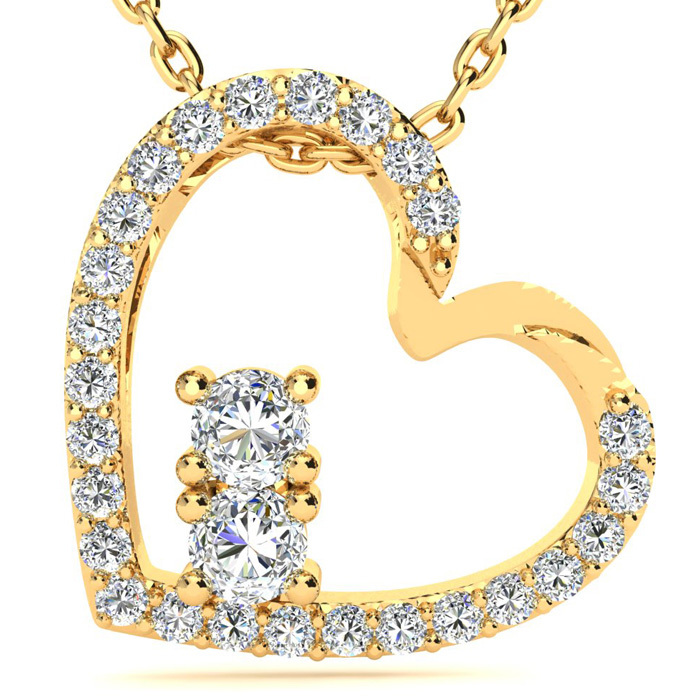 Get one of these 14k yellow gold and diamond heart shaped pendants and you'll ensure your love is forged forever. A diamond jewelry gift is a sure shot way to win her heart all over again. A free chain holding the beautiful diamond K initial pendant makes it lovable and ready to wear. A precious diamond B initial pendant in yellow gold will surely win her heart. Unique design makes it a hit choice for purchaseers. Adding more glamour to the design is a long free chain carrying the pendant. Diamond jewelry makes a woman happy with its beauty and longevity. This diamond O initial pendant in yellow gold is a jewelry gift she is going to cherish everlasting. A sure shot way to win her heart. Our best selling diamond cross. 3/4 carat of I color i-1 clarity matched round diamonds hand set and manufactured by our craftsmen in NYC United States of America . All diamonds set in 14 Yellow Gold and supported with a 16 cable chain with a lobster claw lock and a two inch extender . Our best selling diamond cross. 1/6 carat of I color i-1 clarity matched round diamonds hand set and manufactured by our craftsmen in NYC United States of America . All diamonds set in 14 Yellow Gold and supported with a 16 cable chain with a lobster claw lock and a two inch extender . Our best selling diamond cross. 3/4 carat of H color Si-2 clarity matched round diamonds hand set and manufactured by our craftsmen in NYC United States of America . All diamonds set in 14 Yellow Gold and supported with a 16 cable chain with a lobster claw lock and a two inch extender . Our best selling diamond cross. 1/2 carat of I color i-1 clarity matched round diamonds hand set and manufactured by our craftsmen in NYC United States of America . All diamonds set in 14 Yellow Gold and supported with a 16 cable chain with a lobster claw lock and a two inch extender . Our best selling diamond cross. 1/6 carat of H color Si-2 clarity matched round diamonds hand set and manufactured by our craftsmen in NYC United States of America . All diamonds set in 14 Yellow Gold and supported with a 16 cable chain with a lobster claw lock and a two inch extender . Our best selling diamond cross. 3/4 carat of G color VS-2 clarity matched round diamonds hand set and manufactured by our craftsmen in NYC United States of America . All diamonds set in 14 Yellow Gold and supported with a 16 cable chain with a lobster claw lock and a two inch extender . 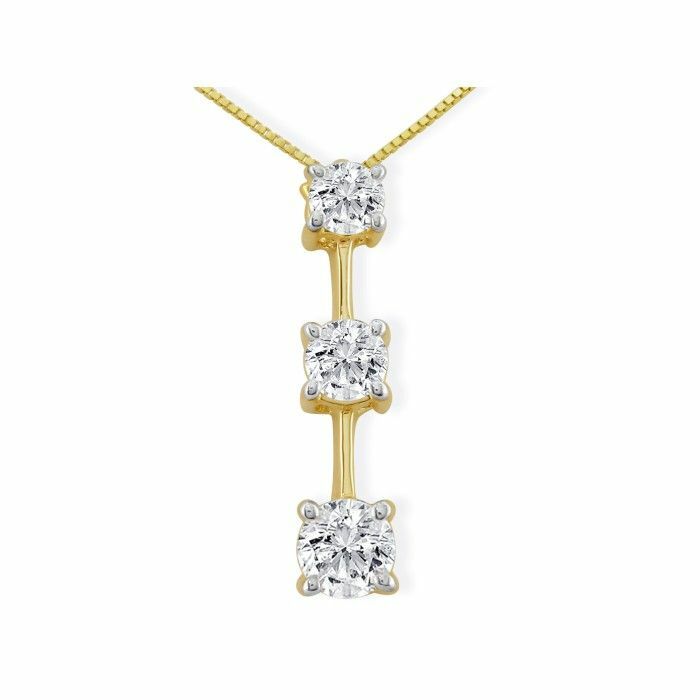 Think of exclusive gift think of pure diamond pendant made of yellow gold. A sure shot way to win her heart. Beautiful pendant is attached to a long chain. Best for all occasions. Beautiful design of diamond circle pendant is capable enough to win her heart. A pretty diamond studded circle with a round diamond fixed in the middle. Tel her to get ready to be swept off her feet as this incredible pendant is strikingly gorgeous. Two Stone Two Diamond Necklace By SuperJeweler , New from our 2Be collection of fine diamond jewelry, this double heart pendant is certain to become an instant classic. This sweet diamond heart necklace features beautiful I-J color fiery round brilliant diamonds of I1-I2 clarity, mounted in solid 14 karat yellow gold. There are 28 diamonds total in this necklace for a 0.42 total carat weight. Comes with free 18 inch chain with spring ring clasp. Show her that some things are meant 2be. Our best selling diamond cross. 1/4 carat of H color Si-2 clarity matched round diamonds hand set and manufactured by our craftsmen in NYC United States of America . All diamonds set in 14 Yellow Gold and supported with a 16 cable chain with a lobster claw lock and a two inch extender . Our best selling diamond cross. 1/2 carat of G color VS-2 clarity matched round diamonds hand set and manufactured by our craftsmen in NYC United States of America . All diamonds set in 14 Yellow Gold and supported with a 16 cable chain with a lobster claw lock and a two inch extender . Our best selling diamond cross. 1/2 carat of H color Si-2 clarity matched round diamonds hand set and manufactured by our craftsmen in NYC United States of America . All diamonds set in 14 Yellow Gold and supported with a 16 cable chain with a lobster claw lock and a two inch extender . Our best selling diamond cross. 1/4 carat of I color i-1 clarity matched round diamonds hand set and manufactured by our craftsmen in NYC United States of America . All diamonds set in 14 Yellow Gold and supported with a 16 cable chain with a lobster claw lock and a two inch extender . Comes with 16 in. yellow gold chain. Our best selling diamond cross. 1/6 carat of G color VS-2 clarity matched round diamonds hand set and manufactured by our craftsmen in NYC United States of America . All diamonds set in 14 Yellow Gold and supported with a 16 cable chain with a lobster claw lock and a two inch extender . Fine Jewelry Vault UBNPD31093Y14D April birthstone Channel Set Diamond Heart Pendant in 14K Yellow Gold 0.15 CT TDW.Valentine Day. Add this unique and beautiful accent to expand your jewelry collection. This gorgeous piece of jewelry is a ideal gift. Create and show you unique style which is so attractive yet so natural. The ideal accessory to brighten up your look. Total Gross Weight - 2.45 gms. Total Gross Weight - 4.00 gms. Total Gross Weight - 2.60 gms. Fascinating information about the Largest Diamond in the World. Please bookmark Piglette for stunning jewelry, flowers, gifts and great items for all occasions from Anniversaries to Christmas.